Products to be sold at Berkshire Farms Market. From Left: Sweet Brook Farm Maple Syrup, Bola Granola and Berkshire Bark. 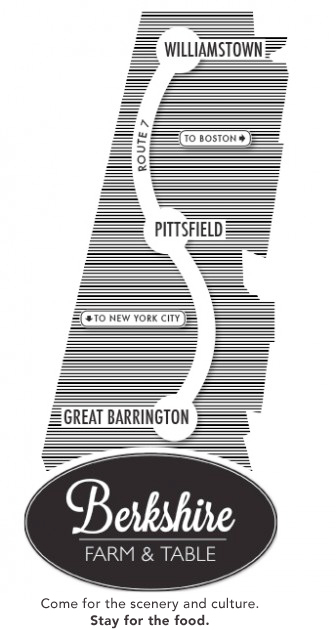 BERKSHIRE FARMS MARKET IS ON THE MAP! On April 30, fans of many Berkshire specialty foods can get them on the fly at Berkshire Farms Market, when the newest outpost of San Mateo, Calif.-based Tastes on the Fly Restaurant Group opens at Boston’s Logan International Airport in the Terminal B connector. Berkshire Farm & Table has partnered with Berkshire Farms Market, the newest grab-and-go retail outlet for Tastes on the Fly, which specializes in bringing outposts of local dining establishments to airports. Since July of 2013, Berkshire Farm & Table has been working with the Berkshire Farms Market team to help facilitate a strong Berkshire food presence in the store. The Berkshire Farms Market opens up extraordinary sales and marketing opportunities for our region. Not only will this retail space provide a high-volume outlet for our region’s products to sell to a captive audience and increase revenue for food makers, it presents a vital portal for the Berkshires to establish a presence as a food source and food destination to travelers. An assortment of Berkshire regional cookbooks and Berkshire authors will be curated by The Red Lion Inn Gift Shop in Stockbridge, Mass. The 1,200-square foot Berkshire Farms Market, located in the new United Airlines Terminal B, will feature foods grown and crafted in the Northeast region. It is based on Tastes on the Fly’s award-winning 5,000-square-foot Napa Farms Market at the San Francisco Airport. That innovative airport-based, farm-fresh food experience celebrates the best of the region’s artisan food purveyors and vendors in a modern, sustainable environment. To reinforce a taste of place and as part of the sourcing and marketing partnership, Berkshire Farm & Table has created a contemporary map of the Berkshire region to be included on the Berkshire Farms Market bag along with information about Berkshires food culture, which will be given out with each purchase. Through agritourism, food craft and cuisine, Berkshire Farm & Table is hoping to lure food lovers who enjoy travel (and travelers who love food) to come taste what is happening in Western Massachusetts. The Berkshire Farms Market allows us to reach this audience directly and tell the story of what we are doing here as farmers, foodmakers and chefs.